The Petrus participants worked with award winning film maker Mat Johns and digital artist Mahboobeh Rajabi to create 6 short films that told the hidden stories belonging to Rochdale�s people. The stories ranged from a video portrait of Petrus volunteer Martin and his love of the Incredible Edible Allotment, to a moving story about the Rochdale Carer�s Choir to films that provided an insight into the realities of life on the streets and drug addiction. Writer and MC Martin Stannage also worked with the group to create poetry inspired by Northern poets from the Rochdale Maskew Collection, such as Carol Anne Duffy, Simon Armitage and Lemn Sissay. The poetry was performed live to a fantastic reception and the poets were also joined by musician Chris Brown who performed a couple of songs also inspired by the theme of Hidden Tales. Part of a longer 18 month creative programme, the project will culminate in 2017 with a large scale event and interactive digital trail that will take the audience on an engaging journey through Rochdale town-centre. Hidden Tales brings together particularly exciting and wide-ranging partners including Touchstones, MMU Education, Innovation and Enterprise Lab (EdLab) and Rochdale Literature and Ideas Festival. Petrus Participants who took part in the project and presented work at the event at Touchstones include: Martin Tobin, Roger Kirby, Charlotte Brackenbury, Frank Kelly, Deborah Simonaitis and Chris Brown. The project was supported by the staff team at Petrus Hub and Falinge Road, produced by Community Arts North West and funded by Awards for All and Arts Council England. The Petrus Community is a well-established registered charity providing residential and day support services for people in housing need throughout the Borough of Rochdale (including Heywood and Middleton), Rossendale and Oldham. Petrus believes people should have access to safe, secure, quality housing. We exist to support a wide range of people in housing need and develop their skills, independence and choice. We have a strong commitment to actively involving the people who use our services in shaping how we work. Community Arts North West (CAN) is a Manchester-based arts organisation who specialise in making great art with people from Greater Manchester�s diverse communities. We believe that access to the arts is everyone�s human right and that the arts can help to build a healthy, inclusive and vibrant society. 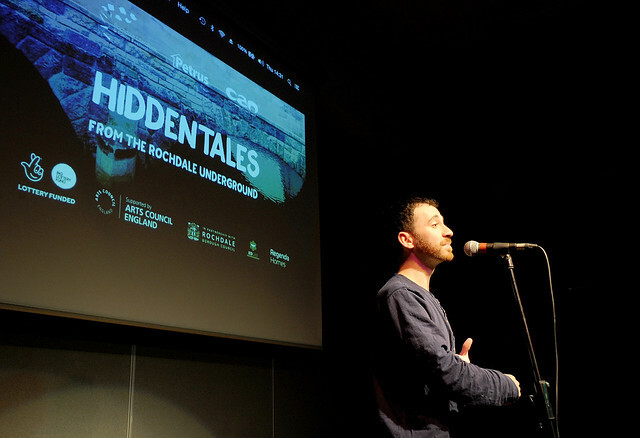 Hidden Tales is part of CAN�s New Communities programme which aims to develop new audiences and create access to cultural production for people that are excluded from or on the fringes of the mainstream. Rochdale Literature and Ideas Festival aims to expand minds through the creation and appreciation of the written word in the borough. The festival is all down to the generosity of Annie and Frank Maskew, a Rochdale couple who met in the original Rochdale Library in the 1950s. They shared a passion for reading and thinking, and bequeathed a sum of money to be used on resources and events related to literature and philosophy and to ensure classic works are available for future generations. The festival is organised by Rochdale Borough Council and funded by the Maskew bequest and by sponsorship.